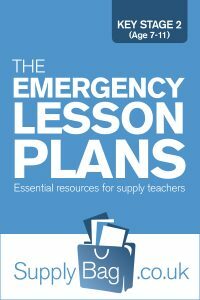 Click to download all 289 of my Key Stage 2 supply teacher emergency lesson plans as a PDF. These emergency lesson plans for Year 3 Literacy are only to be used by supply teachers who are faced with no planning or easily accessible resources. Also to be used following the guidance notes here. Split words given into syllables, clap out with a friend and write with slashes/dashes, dash-es, slash/es. Find words with -le on the end, investigate the occurrence of double consonants before the -le. Practice handwriting, ascenders and descenders. Ping-pong spelling: Children collect own mis-spelt and corrected words on scraps of paper in groups of three. One reads a word aloud, shows the other two for 'n' seconds, hides it, and then the two children take it in turns to say the next letter. Explore a dictionary, where do certain letters fall ('s' towards the end, 'e' close to the beginning) and play games (Find The Word…) based on using dictionary. Identify as many short words as you can inside other, longer words, your name, school name, words given, recognise features and syllables to aid spelling. On board, write words to be contracted, could not, and go through use of apostrophe for contraction, then challenge children to contract all words on board, couldn't. Collect synonyms for shouted/said/walked/ran and improve the power of sentences given. Find in a dictionary some simple words and explore different meanings etc., form, wave, place. Find in own reading books examples of verbs used other than common verbs, chased instead of ran etc. Identify speech marks in dialogue and punctuation conventions associated, i.e. capital letters to start direct speech, commas used etc. Write dialogue of own. Collect words for colours, sizes and moods in groups. Present as a 'word board' for use by rest of class. When to use capital letters. Look in current reading books to find all examples. Sequencing, give them a chronologically based set of sentences, i.e. getting up to arriving at school, and order/connect using first, then, after, meanwhile, etc. Take a book the class have read together, or a well-known story, and plan for it to be a 3/4/5-part mini-TV series… what happens in each episode? Give a basic sentence describing an action, 'Tom moved closer to the door,' and ask the children in pairs to write three more sentences, the first will help build tension, the second set the scene a little more, and the third create suspense, thicken the atmosphere/add to the mood. Collect from reading books and experience story openings and endings, use in re-telling own simple, four sentence story. Character description: 2 parts, physical and non-physical description. Present as police profile, reference for a job, wanted poster, postcard to friends about someone you met on holiday, letter to class about new teacher in new school. Brainstorm words other than basic ones (deny the use of mummy and pyramid in Egyptian story for example) for a topic before writing an opening (setting/character introduction), using three of new words found. Write descriptive setting of the quiet area in the school playground, use all five senses. Write a letter to your favourite author explaining why you like their books. Design an information leaflet for a local visitor attraction/tourist information for your village. Book Reviews: look at what they would like to be included, and design your own format, then complete for your favourite book. Write an A-Z about their school for the Year 2 children arriving in September. Shape poems of musical instruments, the sounds they make and effect on the ear/brain/soul. Alliteration poem, animals coming off the Ark, slithering snakes etc.